What do you use for Apple Gear for? I am a software developer and I.T. Architect. I use my Mac Mini to host a Windows 8.1 VM where I can test my cross platform apps for Mac and PC and soon Mobility. What hardware does your current Mac setup consist of? Why did you go with this particular setup? I needed the best of both worlds (Mac and Windows). As an Architect, I use MSFT Visio for Windows. As a developer I use Visual Studio, Python, and Apache Cordova. The Mac Mini 2011 made the most sense because it allowed me to purchase and install my own SSD and 3rd party 16gb of RAM. 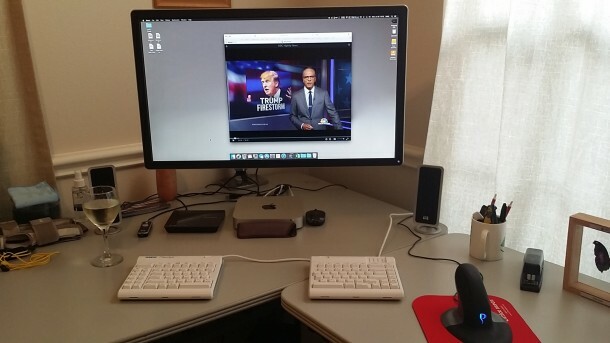 Granted, my desk is not as neat and clean as others on your site, but it’s real! What apps do you use most often? Make sure you keep your OS patches up to date. Enjoy your Mac experience. You can run Windows apps side-by-side using either VMWare Fusion or Parallels. Now it’s your turn! Send us your Apple workstations and Mac setups, go here to get started, it’s a matter of taking some pictures and answering a few questions about the hardware and how you use it. 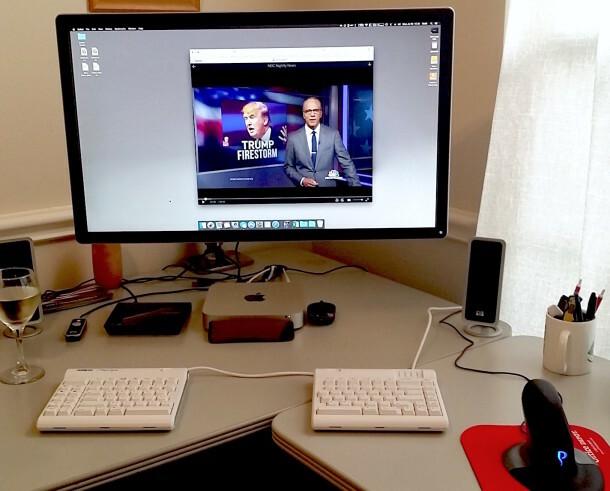 You can also browse through previously featured Mac setups, there are many great workstations out there! By the way, does anyone else see a lot of Ben Carson 2016 ads? I see them a lot on the web! I wonder if anyone is going to vote for that guy. Anyway, how’s that Dell 4k display? Does it run fast with the Intel GPU or is there a lag? I’ve wondered if they would be slow to display such a high resolution, $500 for a 4k display is a great deal though! The 4K Dell works just fine for what my needs are. I wouldn’t recommend any gaming at this resolution unless you’re running a much faster Mac than I have. Overall, it’s been a really good experience. Can’t go back to 1080p now! Cool I need to get an articulating arm stand I like that idea a lot. Looking at Apple’s documentation, Only the late 2014 Mac Mini supports 4K video. Which resolution do you run your 2011 Mac Mini on? And how? Thunderbolt vs HDMI? Inter HD3000 isn’t exactly a “video monster”…. It’s not a video monster, but for my use cases above, it works great! btw: I actually got it to display at full 4K res, but at 30hz. Decided to scale it back to 60hz at my current res. I’m looking to move to a Macbook Pro 15 with retina early next year so that I can push two of these monitors at full 4K, however. Did you see an issue where at less than 4k resolution, the monitor does not show the picture in the full screen and only on a small portion of the screen? – I have that problem with this monitor on windows. Wanted to get this for mac mini mid 2010 and want to be sure it will work. Please reply. What’s the difference between Architect and Developer? Sounds like the same thing to me, a simple MacBook Air user. 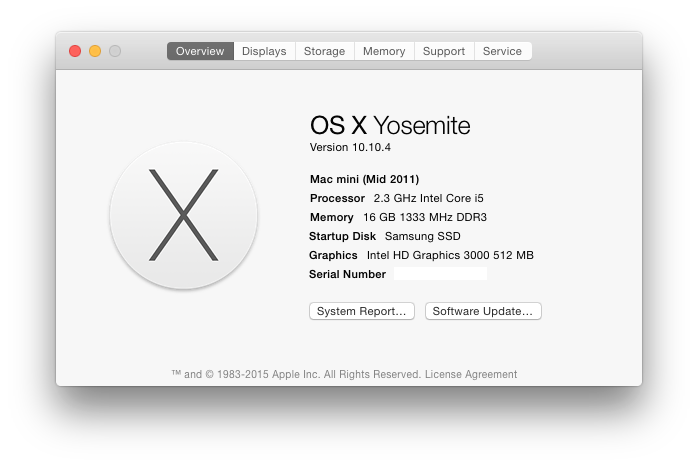 I upgraded from Lion OS system to Yosemite and I’m wondering if El Capitan is worth the time and effort involved in getting used to another new system. I would recommend El Capitan. I use it on my mid-2015 15″ MacBook Pro (Retina) and it’s way faster than Yosemite was. It takes almost no getting used to, because it has the same interface. At least in Brasil… hehe..
Nah. While close, they really are two different disciplines. An Architect can also have development skills (as I do) and vice versa. As a developer, I write the code to the technical specs, but within the design boundaries defined by the architecture. When wearing my Architect hat I focus not on coding, but on defining the integration components and overall design of the solution and how it fits within the enterprise standards. An Architect designs the blueprint. The developer builds/implements the solution based on that blueprint, coupled with the technical specifications. Anyone got a good recommendation for a true Mac-friendly ergonomic keyboard? Hi Phil, I’m a big fan of the Kinesis Freestyle as Keith has here. I use it daily for coding via VMWare View remoting between windows machines. The bespoke copy-paste-delete left hand buttons are priceless ergonomics! Note however, when using WMWare between OSX and a windows machine, I have no idea how to make some of these priceless keys function. @Keith is this an issue you have found with VMWare Fusion? You’d be a saviour if you have a workaround to share!